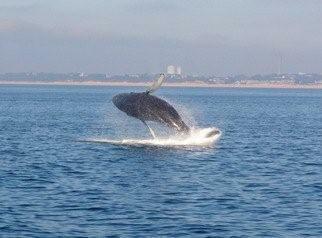 Right whales have been sighted off Herring Cove Beach in Provincetown. Up to sixty whales have been tracked by the Provincetown Center for Coastal Studies which uses boats and planes to track these amazing animals. Speaking of boats, whale watching tours start on Saturday, April 6th. For tickets and additional information please visit the whale watch web site. Tickets are $44 (adults) and $29 (children over 4) and during April they have three tours a day at 9:30am, 1:00pm and 4:30pm. It’s still very cool out on the water so bring warm clothes. The tours are well worth it, bring your camera! Provincetown starts to spring into action in April with the Pilgrim Monument re-opening on April 1st and the start of whale watching tours. One of the highlights in April is the Cabaret Fest sponsored by the Provincetown Business Guild. If you love cabaret music you need to be here! And of course we have rooms for you at The Somerset House Inn.